System reoperation in the context of water resources means changing existing operation and management procedures for a water resources system consisting of supply and conveyance facilities and end user demands with the goal of increasing desired benefits from the system. 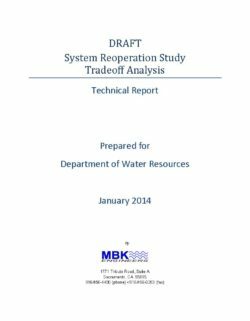 System reoperation may seek to improve existing water facilities to meet existing system needs more efficiently and reliably, or it may seek to prioritize one system need over another. Although reoperation of existing facilities is generally regarded as the preferred alternative to constructing major new facilities, minor physical modifications to existing facilities may be necessary to eliminate constraints to reoperation and to meet operational goals. Changes to the water rights or regulatory framework for allocating water — for example, modifying existing water rights or creating new supply exchange agreements — may also be required. Some systems may be very simple and include only a single surface water reservoir or groundwater basin. Other water systems may be much more complex, consisting of many facilities that form a combination of local, interregional, and interstate water sources and delivery destinations. The concept “system reoperation” applies to the system at all scales, thus reoperation can be implemented at different scales within a system, ranging from individual facilities to several integrated components. System reoperation is generally defined as changing the operational and management procedures of existing water system facilities to obtain water resources related benefits. Reoperation is considered an alternative to constructing major new facilities, although it may consist of physical modification of existing facilities. The specifics associated with a system reoperation strategy will vary among water purveyors depending upon the complexity of their system and their interest in participating in local and or interregional efforts. (I) Integration of flood protection and water supply systems to increase water supply reliability and flood protection, improve water quality, and provide for ecosystem protection and restoration. (II) Reoperation of existing reservoirs, flood facilities, and other water facilities in conjunction with groundwater storage to improve water supply reliability, flood hazard reduction, and ecosystem protection and to reduce groundwater overdraft. (III) Promotion of more effective groundwater management and protection and greater integration of groundwater and surface water resource uses. (IV) Improvement of existing water conveyance systems to increase water supply reliability, improve water quality, expand flood protection, and protect and restore ecosystems. Reoperation options include integration of flood control and water supply systems, effective conjunctive management, and improvements to existing water conveyance systems. This phase of the analysis focuses on integration of flood control enhancing water supply systems and expanded conjunctive management with existing conveyance systems. An analysis was designed and performed with the goal of identifying potential reoperation options and to improve understanding of existing system constraints. The analysis is referred to as the tradeoff analysis in recognition of the fact that the existing flood control/water supply system is highly integrated and currently operated to meet water supply, flood control, and ecosystem purposes. Current system operations are complex and frequently constrained by flood control and ecosystem requirements and water rights and contracts for the beneficial use of water. Therefore, reoperation options designed to meet one of the three objectives of the System Reoperation Study frequently create tradeoffs with the other objectives. For example, reductions in required reservoir space for flood control may improve water supply reliability but increase risk of flood damage. The tradeoff analysis is a reconnaissance-level study designed to help illustrate how operational changes designed for one purpose can affect other objectives. Because the existing reservoir and conveyance system is highly integrated and constrained, changes in operation for one purpose create tradeoffs with other purposes. A reconnaissance-level study can help identify these tradeoffs, some of which may be unexpected or unintended, and thereby help guide refinement of more promising options. Model simulations performed in the tradeoff analysis are not refined for the purpose of quantifying benefits or impacts, but rather are intended to illustrate how operational changes in one area affect other areas. For example, how Central Valley Project (CVP) operations can affect State Water Project (SWP) operations, and vice versa. 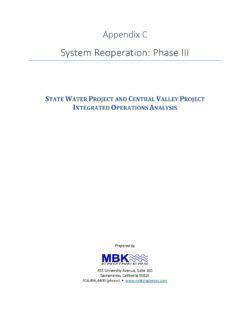 The California Department of Water Resources (DWR) is conducting a system reoperation study (SRS) in cooperation with other State and federal agencies, local water districts, groundwater managers, and other stakeholders, to identify potential strategies for reoperation of the statewide flood protection and water supply systems. 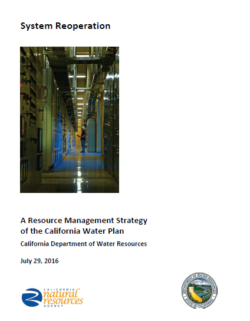 The opportunity to reoperate portions of California’s statewide water system to yield increased water resources-related benefits was recognized by the State Legislature in Senate Bill X2 1 (SB X2 1) (Perata, 2008 – Water Code Section 83002.5). California’s statewide water system is comprised of a multitude of local, state, and federal projects. These projects include facilities such as dams and reservoirs, hydropower plants, canals, and water diversion structures. Many of these facilities were developed in the early to mid-20th century, and were not designed, constructed, or operated as an integrated water supply and flood management system. Over time, operations of the two largest water supply projects, the State Water Project (SWP), operated by DWR and the Central Valley Project (CVP), operated by the U.S. Department of the Interior’s Bureau of Reclamation (Reclamation), have been integrated to a certain degree. California’s water supply and flood management infrastructure is physically interconnected to the extent that it is technically feasible to move water around the system from Trinity County in the north to Imperial County in the south. However, the management of the water system is not as well integrated as it could be. The underlying logic of the SRS is that California can do much more with its existing water infrastructure by taking advantage of the physical interconnections (and enhancing them) while also operating the system in a coordinated manner to optimize the benefits. The current focus of the SRS is the Central Valley because this region has the highest integration of water supply and flood management facilities. Additionally, the greatest potential for ecosystem restoration through infrastructure reoperation is found in the Central Valley because the existing infrastructure has had a profound effect on aquatic ecosystems. 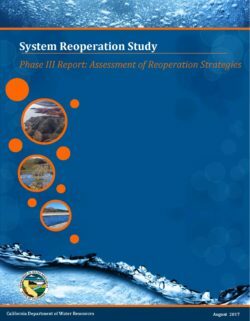 The California Department of Water Resources (DWR) is conducting a System Reoperation Study (SRS) in cooperation with other State and federal agencies, local water districts, groundwater managers, and other stakeholders, to identify potential strategies for reoperation of the statewide flood protection and water supply systems. 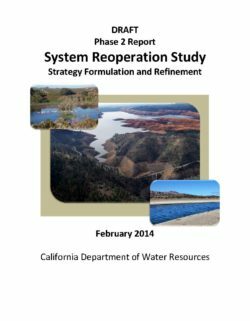 The opportunity to reoperate portions of California’s statewide water system to yield increased water resources-related benefits was recognized by the State Legislature in Senate Bill X2 1 (SB X2 1) (Perata 2008). • Improve the reliability of municipal and irrigation water supply. • Restore and protect ecosystems. • Buffer the hydrologic variations expected from climate change. California’s statewide water system is composed of a multitude of local, State, and federal projects. These projects include dams and reservoirs, hydropower plants, canals, and water diversion structures. Many of these facilities were developed in the early to mid-20th century, and were not designed, constructed, or operated as an integrated water supply and flood management system. Over time, operations of the two largest water supply projects, the State Water Project (SWP), operated by DWR, and the Central Valley Project (CVP), operated by the U.S. Department of the Interior’s Bureau of Reclamation (Reclamation), have been integrated to a certain degree. California’s water supply and flood management infrastructure is physically interconnected to the extent that it is technically feasible to move water around the system, from Trinity County in the north to Imperial County in the south. However, the management of the water system is not as well integrated as it could be. The underlying logic of the SRS is that California can do much more with its existing water infrastructure by taking advantage of the physical interconnections (and enhancing them) while also operating the system in a coordinated manner to optimize the benefits. The current focus of the SRS is the Central Valley, because this region has the highest integration of water supply and flood management facilities. Additionally, the greatest potential for ecosystem restoration through infrastructure reoperation is found in the Central Valley, because the existing infrastructure has had a profound effect on aquatic ecosystems. Figure ES-1 shows the location of the Central Valley and the study area for the SRS. Figure 1-1 also shows major features of the CVP and SWP. Senate Bill (SB) X2 1 mandated and allocated resources for “planning and feasibility studies to identify potential options for the reoperation of the state's flood protection and water supply systems that will optimize the use of existing facilities and groundwater storage capacity.” Specifically, SB X2 1 stipulated that the studies shall be designed to determine the potential to achieve integration of flood protection and water supply systems to increase water supply reliability and flood protection, improve water quality, and provide for ecosystem protection and restoration. For this evaluation, a suite of ecosystem evaluation metrics were developed to evaluate the effects of reoperation scenarios simulated in Phases II and III of the SRP. Phase II reoperation scenarios were used to develop and test the ecosystem evaluation framework, and to quantify the effects of reoperation at Shasta and Oroville paired with conjunctive use and spring pulse flows. The next step was studying the ecosystem effects of Forecast-Based-Operation (FBO) at Shasta and Oroville combined with conjunctive use and spring pulse flows. Finally, t additional scenarios were developed and evaluated to explore the sensitivity of ecosystem performance to FBO and the potential for reoperation to enhance major ongoing ecosystem restoration efforts in the system. 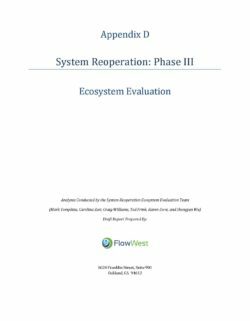 The purpose of this report is to document and describe the methods and results from the ecosystem evaluation to date, and to outline additional steps that could optimize reoperation scenarios for ecosystem improvement. The California Department of Water Resources (DWR) is conducting a system reoperation study (SRS) in cooperation with other state and federal agencies, local water districts, groundwater managers, and other stakeholders to identify potential strategies for reoperation of the statewide flood protection and water supply systems. The opportunity to reoperate portions of California’s statewide water system to yield increased water resources–related benefits was recognized by the State Legislature in Senate Bill (SB) X2 1 (Perata, 2008 – Water Code Section 83002.5). 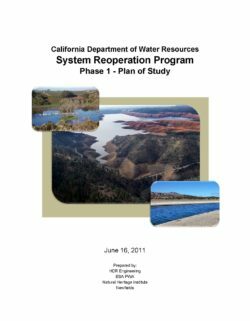 A component of the SRS is to evaluate how operational improvements of the state and federal water Projects in California may increase water supply and enhance ecosystem function and habitat. The Central Valley Project (CVP) generally has more storage and less conveyance flexibility; the opposite is generally true for the State Water Project (SWP). The SWP and CVP are operated by DWR and the U.S. Bureau of Reclamation (Reclamation), respectively. The operation of the two Projects is coordinated in accordance with the 1986 Coordinated Operating Agreement and other agreements. Though the operation is coordinated, the SWP and CVP are operating as two distinct units. They each have different contractual obligations and operating constraints. Operational improvements using strengths and assets of both Projects may result in improved operational efficiency and help achieve goals of the SRS. The purpose of this effort is to assess potential benefits of operating the SWP and CVP as a single, integrated Project.